I love it when you see a call out for a tutorial or blog post and it gets you really inspired to create something new! That’s what happened when I was introduced to the &Stitches blog. They host a Summer Bloggin’ Series each year to share summer themed and inspired sewing projects. Because it was winter here, I was keen to start thinking about something summery, tropical and fun. 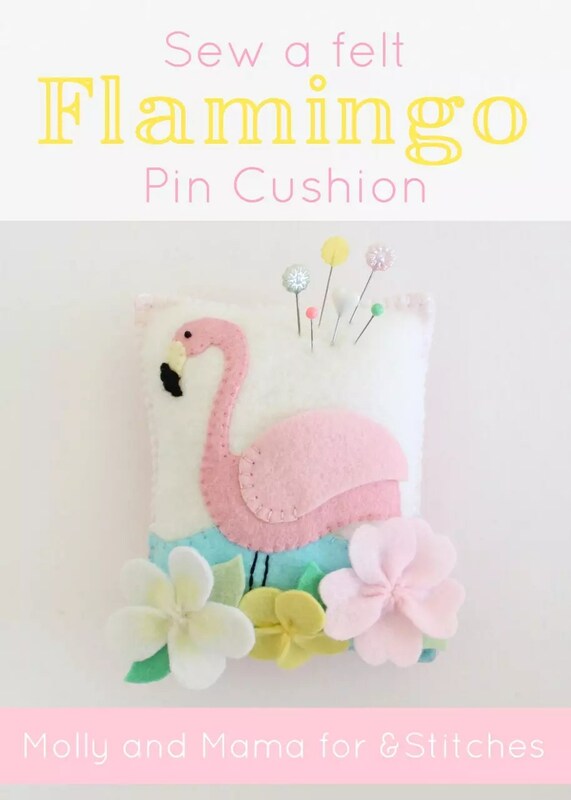 So I decided to design a flamingo pin cushion tutorial for them. And naturally, I made it with wool felt! This 6″ x 4″ felt pin cushion is an easy sew. The tutorial on &Stitches includes tips for appliquéing a cute little tropical flamingo onto the front. And it also explains how to create the felt flowers to decorate it with. There are three flower patterns included. And I even tinted one of the white flowers with yellow centres so that it looks like a frangipani! They’re all super easy to make. You can head over to &Stitches to see the full tutorial, for step-by-step instructions, lots of photos, and the free printable pattern template too. Lots of people ask me where I buy my wool felt for my sewing projects. I love supporting my local stores. But if you’re looking for wool felt suppliers, they do ship to most places. So be sure to visit Rose Petal Collections and The Quilter’s Angel for more information. 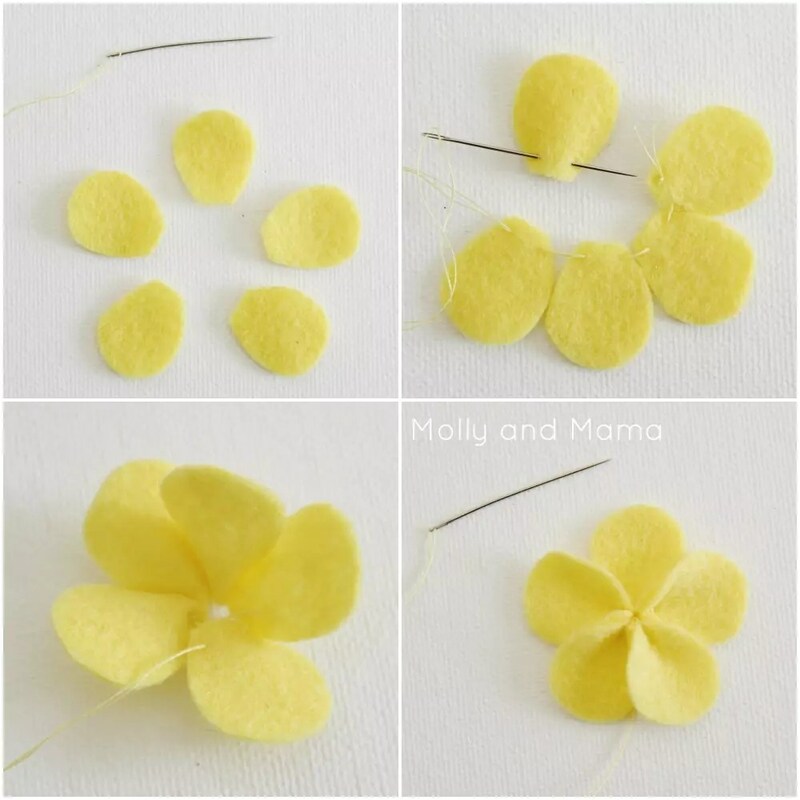 And if you’re after more felt projects from Molly and Mama, the tutorials page has some really cute ideas, like this felt flower pin cushion. Or you can pop by the store, to see the Miss Molly felt pin cushion pattern, and the Sleepy Cloud too! 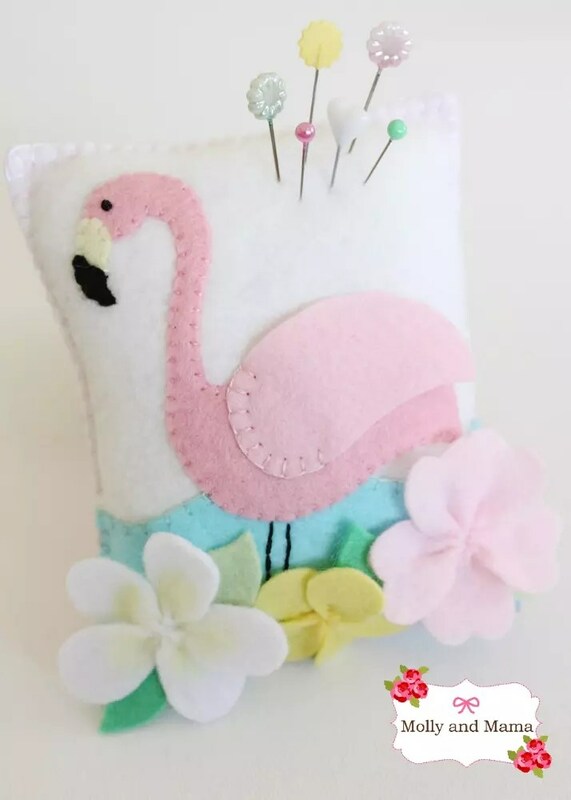 And if you end up stitching a felt flamingo pin cushion, be sure to show it off. I get such a kick out of seeing all of your creations! You can post it on the Molly and Mama facebook page, or tag me on Instagram @mollyandmama. Is there a template for the flamingo pinchushion? Thank you. Hello Dianne, you’ll need to follow the link to the &Stitches blog where you will find the full tutorial and link to download the template. Happy sewing, Lauren.